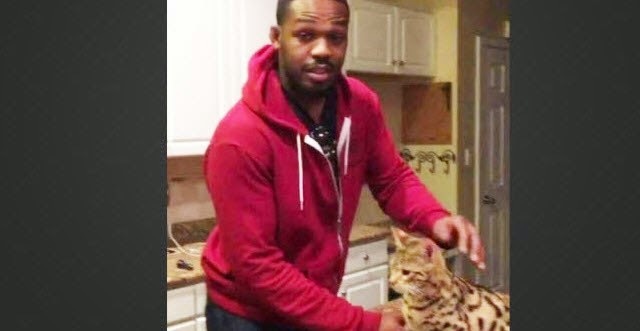 Uproxx: UFC Light Heavyweight Champion Jon Jones is prone to posting and then removing pictures and videos from his Instagram account without warning. Just recently, this adorable picture of Jon and his serval cat went up and down almost instantly. Thankfully, an internet hero grabbed a screenshot, so we can examine the photo for a possible reason Jon might have removed the picture. 1. The cat looks slightly unkempt, and Jon didn’t want his fans to think that he’s an inattentive pet owner. 2. The cord on the counter behind Jon is a little tangled, and he wouldn’t want to come off as messy. 3. Jon isn’t wearing official Reebok-branded apparel, which isn’t allowed under his current contract. 4. He isn’t wearing his UFC title, which does not show proper respect to the belt that he worked so hard for, the Ultimate Fighting Championship, and Zuffa. 5. He left his pestle (?) on the counter after grinding up some fresh herbs, perhaps for a pesto dish instead of washing it and putting it away. 6. His cat doesn’t have a collar, which isn’t safe, especially because he’s lost cats in the past. 7. Neither Jon or the cat are smiling or posing, so he was caught off guard and doesn’t like that moment of vulnerability being broadcast to the world. 8. The picture is just too blurry, and as a champion, Jon demands more excellence in his photographs. 9. The picture was posted without an inspirational message on it, and he can’t motivate others with just a simple picture of him and a cat. 10. Maybe he just didn’t want a picture of what might allegedly be a weed pipe floating out there on the internet.